Duluthian Adelaide Thurston dreamed of being an actress from childhood, and through hard work and determination made a career for herself on the stage. I was brought up in the quietest home imaginable…the last place you would think of putting forth histrionic ambitions. My parents were strict Methodists, so I saw more of the inside of a church than of a theatre. I was ten years old when I first went to a play. That night as I walked home I had made a fixed determination to be an actress. Adelaide attended Duluth High School, graduating in June of 1888. As part of the program for the commencement exercise, she recited the Oliver Wendell Holmes poem “Aunt Tabitha: The Young Girl’s Poem.” After high school, she enrolled in the teacher training program offered by the Duluth school system, taught by Superintendent Robert E. Denfeld, which pre-dated university training of teachers (the Duluth Normal School wouldn’t open until 1901). Adelaide taught first grade at Fairmount Elementary beginning in 1891. At the same time, she was very involved in amateur theatrics in Duluth. From the 1880s to 1895, she performed in plays and did dramatic readings. In 1894, the Duluth News Tribune said “her dramatic readings, which have become quite noted, have served to enhance her reputation, and she is recognized as one of the most promising and brightest of the amateur performers of Duluth.” On June 25, 1895, after finishing the school year, she left Duluth and headed to New York to pursue her dream of a career on the stage. She wouldn’t return to Duluth for six years. Before too long she had landed a role in a play called Alabama, and next she was hired to play Bossie in A Texas Steer, a political satire by Charles Hale Hoyt. In 1897, she took a job in a stock company in Pittsburgh. On Christmas Day, 1897, she married Arthur W. Little in New York. She had first met Little in Duluth when he was cashier at the Lyceum Theater. About this time Adelaide started calling herself Thurston, her mother’s maiden name. She toured around the country in The Little Minister, receiving good reviews and positive comparisons to the performance of Maude Adams. In the 1900–1901 season, Thurston performed in the play The Greatest Thing in the World alongside the famous actress Sarah Cowell LeMoyne. It opened in New York at Wallack’s Theater on October 8, 1900. Thurston finally returned to Duluth for a rest at her parents’ home in the summer of 1901. Adelaide Thurston was welcomed home last evening. The Lyceum Theatre was packed to its capacity to greet the winsome little lady who made her first official bow in her home city at that time. Her first appearance was the signal for a burst of applause, enthusiastic and genuinely affectionate. The next day, Thurston appeared with her attorney in the chambers of St. Louis County District Judge Homer B. Dibell and was granted a divorce from her husband, Arthur W. Little. The papers had been quietly filed in September and had been kept a secret. She charged Little with desertion, stating he had left her without cause on July 9, 1900. The action legally changed her name to Adelaide Thurston. The next years were busy for Thurston. 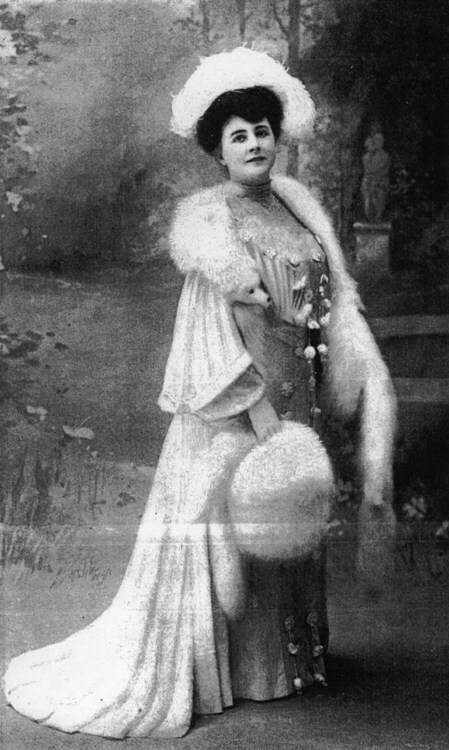 She toured the country, starring in new a play every season or two, starting with At Cozy Corners (1902–1903) and Polly Primrose (1903–1905). The latter was written for her by Paul Wilstach, brother of her two managers Frank and Claxton Wilstach. She performed Polly Primrose at the Lyceum in Duluth on February 8, 1904. In the 1905–1906 season she starred in The Triumph of Betty, which she performed at the Lyceum on November 2, 1905. The authors, W. A. Tremayne and Irving L. Hall, said they created the role endeavoring to represent Thurston as she really is. For the 1906–1907 season, Thurston found great success playing the role of Flotsam in The Girl From Out Yonder, by Pauline Phelps and Marion Short. She appeared in the play for two performances at the Lyceum in Duluth on Christmas Day, 1907. The News Tribune reported that, following the matinee, she invited people on to the stage with her and “a throng of her admirers availed themselves of the opportunity to meet her.” The authors of The Girl From Out Yonder revised the last act over the summer and Thurston performed it again in the 1907-1908 season. It opened for a week in New York in September and then went on the road. Thurston’s sister, Eva Sawyer—an active amateur actress in Duluth—joined the company in Iowa in November in the role of Clarice Stapleton, replacing an actress who had become ill. They performed the play in Duluth twice on Thanksgiving Day 1907 and drew record crowds at the Lyceum. Except for a couple of seasons spent in Europe, Thurston spent her summer vacations in Duluth, visiting her parents in their home at 208 South Fifty-Ninth Avenue West. In the spring of 1908 she purchased a home in New Jersey and moved her parents and Eva there in April. The parents must have missed Duluth—they were back in the Zenith City the next year. Eva continued her acting career and in September of 1909 the sisters opened the play Contrary Mary, by Edith Ellis, in Newport News, Virginia. Eva, now known as Eva Thurston, spent the next season with the Lyric stock company in Minneapolis, but in June of 1910 returned to Duluth and married Frank E. Parker, president of Rust-Parker Co., a wholesale grocery business. Eva remained active in the theater in Duluth, working with the Duluth Drama League and, in 1914, was one of the founders of the Little Theater, forerunner of the Duluth Playhouse. Adelaide Thurston continued to act and tour in plays such as The Woman’s Hour by Frederic Paulding and Hester Temple, Miss Ananias by Catherine Chisolm Cushing, The Love Affair also by Paulding, and The Defiance by Harry W. Hawley. She spent part of 1915 at the Fifth Avenue Theater in New York doing a comedy sketch called Taken on Trust. She also became interested in other activities. In 1916 she produced and acted in a play called The New York Idea to raise money for the National Security League. She spent the winter of 1917 in Minneapolis studying English composition and essays with Dr. Richard Burton, professor of English literature at the University of Minnesota. At the same time, she taught at the Adelaide Thurston School of Dramatic Art, which was affiliated with the Twin City Conservation of Music on Nicollet Avenue. She returned to Duluth that fall and lectured to the public school principals on “English Diction and the Voice in Speech,” recommending the schools hire specialists to teach oral English. That fall she was also preparing plays to perform to cantonments, or military camps. She worked to recruit men for the military and did public speaking on war topics. After the war, Thurston left the stage and began work as a speaker for the Republican Party and the Republican Women’s League. She told the Duluth News Tribune in 1921, “I left a world of make-believe to enter a world of reality and find it far more stimulating and interesting.” She traveled around the country speaking to Republican groups and urging women to use their newly won right to vote intelligently. Adelaide Thurston died in New Jersey on February 10, 1951, at the age of 78. Her sister Eva remained in Duluth and continued to be active in local theater. In 1971, she was given a special achievement award from the Duluth Playhouse for her contributions to theater in Duluth. She died in Duluth at the age of 92 on April 12, 1982. Demonstrating that talent ran in the family, Eva’s daughter Adelaide Parker followed her mother and aunt into show business as a dancer. After graduating from Duluth Central High School in 1931, she moved to New York and in 1932 was chosen as a member of the Rockettes dance team that performed at the opening of New York’s Radio City Music Hall. She later danced in films but returned to Duluth to marry Bertram Bergeron in 1938 and spent the rest of her life raising her three children in the Zenith City.